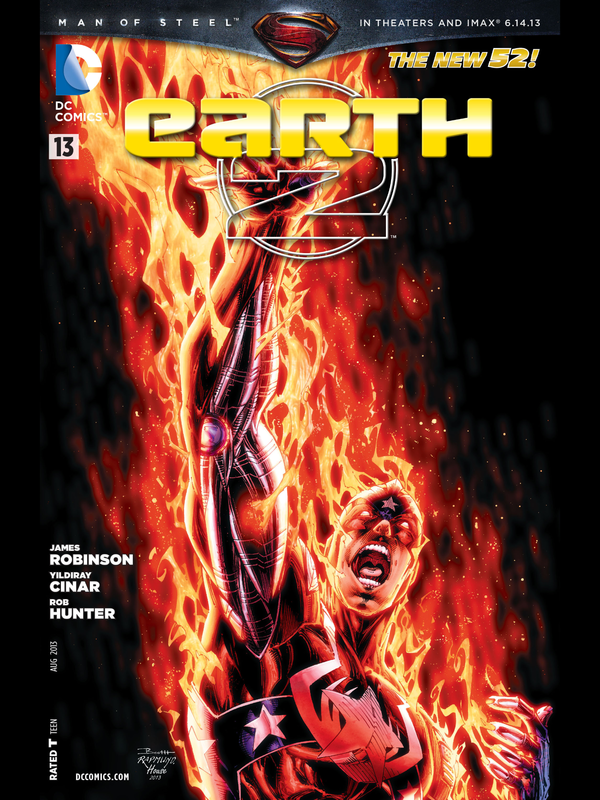 This issue of Earth 2 reveals more about the first “new wonder” of the World Army…and it isn’t who you think. Nope, not Atom…but Captain Steel! This New 52 Captain Steel has an excellent and tragic origin story, one that gives him the opportunity to truly shine. You won’t see Jay this issue, nor will you follow-up on the cliffhanger from the Annual with Scott and Barda…but it is a story well worth reading, and it expands the wonderful new Earth 2 that James Robinson has imagined for his fans. SOME SPOILERS AHEAD! PLEASE READ THE ISSUE BEFORE GOING FURTHER! The new origin of Captain Steel has him depicted as native to the Philippines but an American Citizen, given his amazing powers by his father in an attempt to save his life. His power set is a bit expanded from prior iterations, not god-modded but rather set in a way that provide a little more interest to what a Captain Steel can mean to the World Army and to his fellow future JSA’ers. He is sent to explore the one fire pit created by Terry Sloane that is not completely toxic, to see what (or who) may be there. While this goes on, Hawkgirl is continuing the search for what happened to Alan Scott’s partner Sam, only to find that there may be an Apokolyptian connection involved…more on that in future issues, I’m sure. Hawkgirl briefly meets up with the very mysterious new Batman of Earth 2, who seems to have that disappearing act nailed down exceptionally well, thank you very much. As we go back to Rio, we learn what Steel has found…and it may be one of the biggest danger our new Wonders have faced! 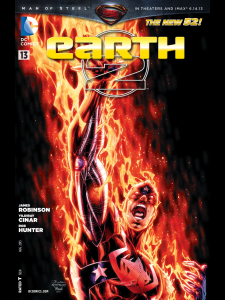 To find out more…you’ll need to grab Earth 2 #13. James Robinson’s script is great once again, proving that even a formerly second-tier character like Steel can be quite amazing in the right hands. He is also giving us just enough new Batman to tantalize without giving away too much too soon. Yildiray Cinar and Rob Hunter provide the pencils and inks and Pete Pantazis does the colors for some excellent artwork in this book. The redesign of Steel is one of the best of this new group of Wonders, paying just enough tribute to the old while updating the look for this New 52-style Earth 2. My only minor complaint is that there was no follow-up to the cliffhanger ending from the annual. Still, this is still one of the best series in the DC lineup – hopefully with upcoming changes they can continue this level of quality. This entry was posted in Reviews and tagged Batman, Captain Steel, Earth 2, Hawkgirl, James Robinson on June 5, 2013 by Ed Garrett.